Trust me, after a few batches of this, you won't be able to go back to Swiss Miss! In a saucepan, combine sugar, cocoa, and salt; add water. Cook and stir over medium heat until mixture boils. Boil and stir 2 minutes. Stir in milk and evaporated milk (or cream) and heat. Do not boil. Remove from heat and add vanilla. Makes 8 cups. *The original recipe calls for a full cup of sugar, but I have never actually made it with that much. It is VERY overly sweet to me. 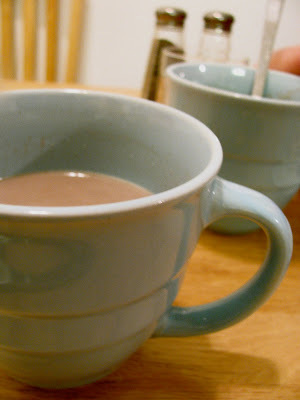 I use 2/3 cups, which (oddly enough) doesn't make the cocoa taste darker, just brings out the chocolate flavor a little more and makes it healthier. This sounds so good. We are big hot cocoa drinkers at this house, so I will definitely give this a try. Thanks! It IS so good! Super rich and creamy. It's also fine without the evaporated milk (though it lacks that extra richness). Oh, and also - it can be stored in the refrigerator for a few days afterward.